Choose: Communication Cable 50ft. Communicaton Cable 75ft. Communication Cable 100ft. Communication Cable 200ft. Communication Cable 50ft. Communicaton Cable 75ft. Communication Cable 100ft. Communication Cable 200ft. The FloLogic CC-F1008 Replacement Communication Cable is specifically designed for the FloLogic Water Leak Detection System 3.5. The CC-F1008 communication cable is available in 50, 75, 100 and 200 foot options. 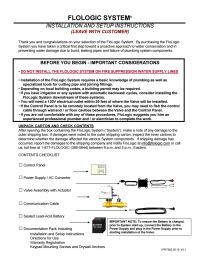 Please read through the FloLogic System 3.5 Installation Guide for installation instructions. Cable lengths are available in 50, 75, 100 and 200 foot options.